Welcome to the third post in the Choose Your Own Black and White Printables series. For those just joining us here’s the run down. Each week I’m sharing black and versions of existing printables. The series will run until the requests stop coming in. So if there is a printable (or many printables) that you’d love to have a black and white version of, just click the link above to fill out the form and submit your request. 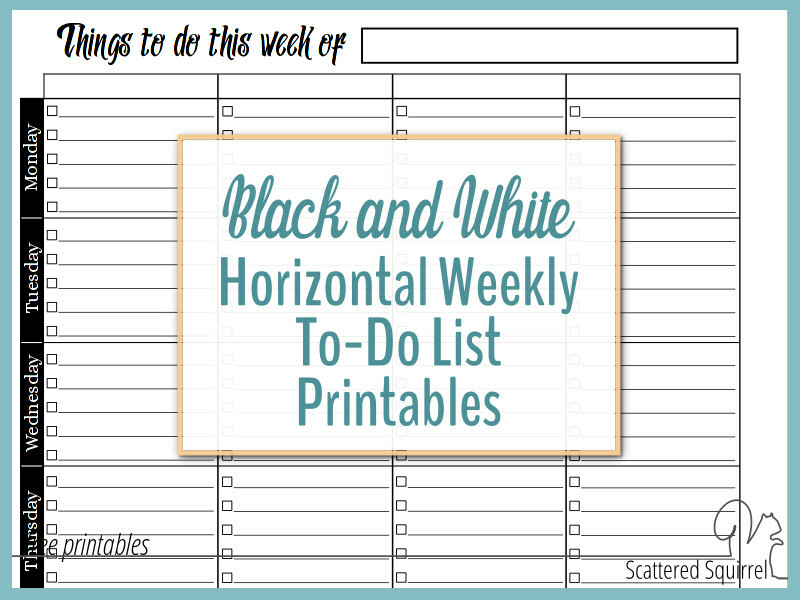 As the title says, this week I’m sharing black and white horizontal weekly to-do list printables. What the title doesn’t say is that these are the first of the requested printables. I believe that printables can be a valuable tool in our quest to better manage our homes, times, and lives in general. It’s one of the main reasons why I make so many of them. Sometimes I’m searching for a system that will meet my needs and sometimes I have an idea that maybe won’t work for me, but might for someone else. But the number one reason I love making them is to share them. 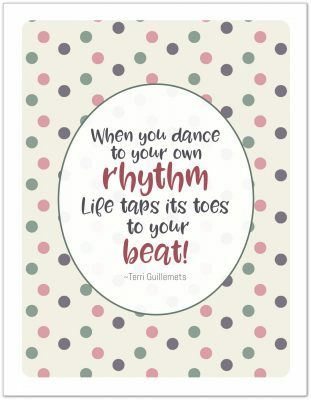 It brightens my day when I hear that someone has found a printable here that is just what they were looking for. Or that they didn’t know would work for them, but they gave it a try and it did. So, being able to share a series like this with you all, is amazing. And before I share today’s printables I just wanted to take a moment and say thank you to all of you. These printables were originally created out of a need to stop feeling overwhelmed by my to-do list. I was in a state of transition in our home. You know those times when your family’s lives and needs are changing and it ripples out and affects everything else? 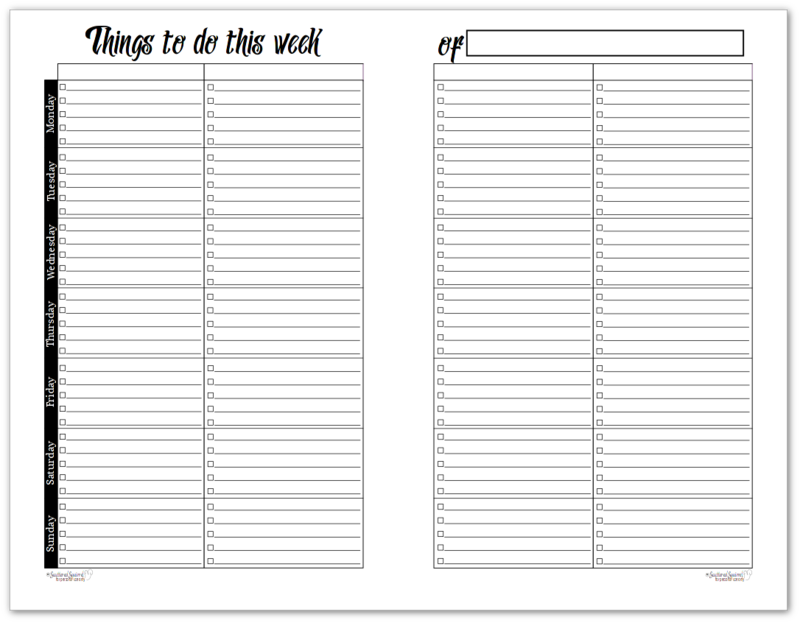 You can read that post here –> Weekly To-Do List Printables. I still keep a few of these in all my planners for those times when I need to break my to-do list down into manageable chunks. You won’t find either of these versions in colour on the blog – yet! I had the Understated Rainbow ones made, but I never got around to sharing them. They’re coming though, at some point. You’ll notice that each daily section only had five slots for jotting things down. That was done on purpose to make sure I wasn’t overloading my to-do list. The category slots at the top of each column are blank so that you create the ones that best suit your needs. 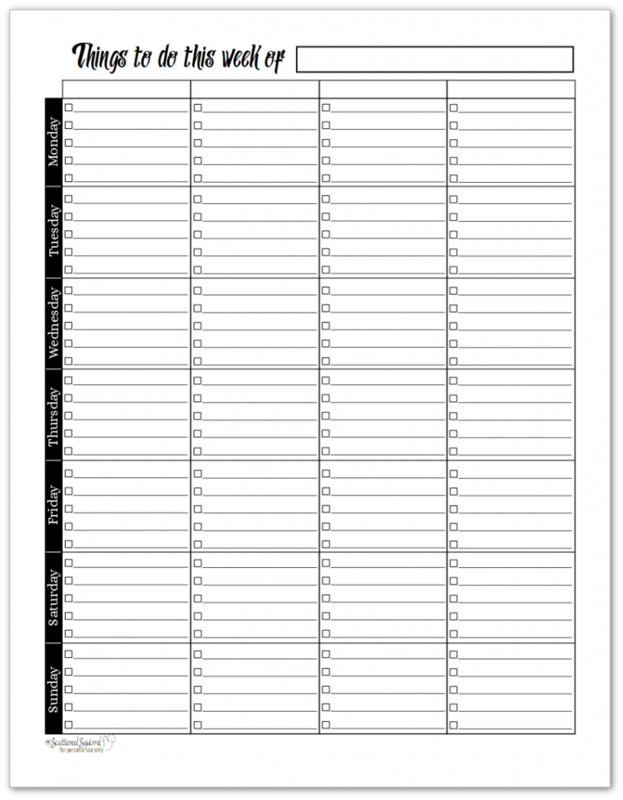 The half-size versions ended up turning into a two page per week printable. The columns ended up being super squishy when I tried keeping it to one page. These printables were never meant to replace my planner. They were designed to help supplement my planner and help me get back on track without feeling overwhelmed. I’m curious to know what you think about the black and white horizontal weekly to-do list printables- drop me a line in the comments below and let me know. Next week we’re switching gears and I’ll be sharing some monthly printables. I hope you’ll check back in to see them.